Fabric Mart Fabricistas: Made by a Fabricista: A Study in Contrasts & Getting Ready for Spring! Made by a Fabricista: A Study in Contrasts & Getting Ready for Spring! For my March post, I knew I wanted to make some spring dresses. I also know that I tend to sew brightly colored garments and I need some neutral garments in my closet, so I decided to make not one, but two dresses and to make them different in style, texture, and color! 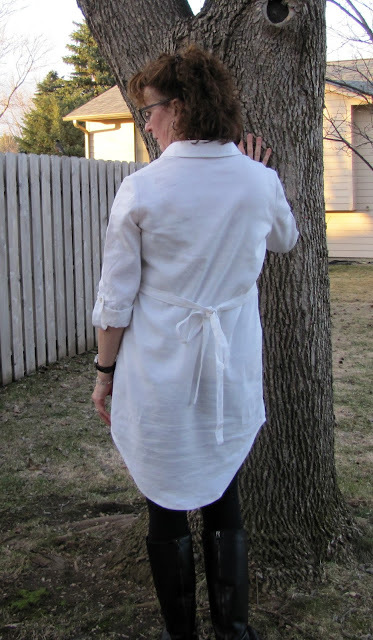 The Ivory, off-white is a super yummy Rayon-Linen blend that was perfect for this dress. This particular fabric is sold out, but you can find others HERE. This dress is made from an ITY knit. The fabric is sold out, but you can find many other options HERE. My goal was to make two entirely different garments--I think I achieved that, what do you think? For the off-white dress, I used McCall's 6885 which is an easy fit dress that is made from a woven fabric. Fitting through the bust and shoulders is essential as the rest of the garment is rather rectangular shaped, perfect for what I envisioned. I really wanted the placket and collar to look polished so I auditioned several weights of interfacing until I found the one that works best. I picked Pro-Woven Fusible Light Crisp Interfacing from Fashion Sewing Supply. Heavier interfacings will give a more structured look and lightweight interfacing will give some stability but more casual feel. The buttons were shell buttons from my stash and I think they are the perfect size so they don't overpower the placket opening. For the very colorful dress, I used this super cute and luscious knit in some of my most favorite colors! (sold out now, but other ITY knits can be found HERE.) The pattern is Simplicity 1018. This one also needs to fit through the bust but is much more fitted all over and flares out at the hem to give it some twirl-ability. I treat my knits well when sewing by testing the stitches on the serger and whether my coverstitch or a single needle stretch stitch will work best for the hems. If you get wavy seams when using your serger, pull out your manual and read about how to adjust the various knobs so that your seams lie nice and flat, just like mine do! I am also pretty proud of the print matching at the princess seams, especially on the garment front. Can you see my seams? I also found a nice way to eliminate the little bulge you can get at an intersecting seam where the binding and neckline meet. At the fold line on the binding, clip the seam through the outer part of the seam but not through the innermost seam. Next fold one part of the seam to one side and the remaining seam the opposite way. With this knit, I used a bright pink thread to top-stitch the seam down and at the hems. For soft and luscious knits such as this, I prefer using a lighter weight thread and a stretch stitch for the hems. I am so looking forward to spring! We've had some unseasonably warm weather here in the Northern Plains, so I've been able to wear both of these uber comfortable dresses! I love spring! Especially like the detail work on the white tunic. Very professional! Thank you Penny! I appreciate your kind words! Great job on these, Sue! Especially that placket! I have the same pink fabric- looks perfect for Spring. Thanks Ann, I am very proud of that placket! Enjoy the pink fabric, it sews like a dream! These both look like they will be high in your wardrobe rotation, so pretty! Thank you Elizabeth! I have enjoyed wearing these pieces!